When fans heard that there would be a Life is Strange prequel, and it was being made by a new studio, we feared the worst. And when it turned out that it would focus on Chloe, the fast-talking, hot mess of a heart at the center of Arcadia Bay's drama, we were back on board. Not that it would be an easy task; the original game includes (spoiler warning) time travel, suicide, drugs, and a serial killer. New studio Deck Nine had to build a story that would explain Chloe's history and introduce Rachel Amber, a character who haunted the original game through flashbacks and missing posters. Episode one of three of Life is Strange: Before the Storm has just been released (and it's brilliant), so we caught up with game co-director Chris Floyd to talk about the tricks and troubles of creating a prequel for such a unique story. What made you feel like there were still stories to tell in Arcadia Bay? Why stay with those characters and that world? Chris Floyd: We did look at a sequel, and of course that didn't make sense. We didn't want to make one of the two very different endings 'the' ending; we wanted everyone to be able to own their ending for their story with the first game. "Chloe's a little bit more of a wrecking ball"
So we started looking at a prequel, and Square gave us, to their credit, a lot of creative freedom to think about a lot of different stories in that context, and a lot of different characters. But we kept orbiting around Chloe, and I think the reasons were because she seemed like such a fascinating character to be a protagonist for us. She's very different from Max, and her whole approach to everything is kind of the opposite of Max in so many ways. So that sounded like fun. Max was really intriguing, because she was so cautious and so observant and all of that. Chloe's a little bit more of a wrecking ball, going to bash through whatever it is in her way and boldly go wherever it is she wants to go. So that just sounded fun, and then her situation at this point in time when we started looking at three years before the beginning of Life is Strange - she's a couple of years out from her father dying and Max leaving and David coming into her home, her mom's dating David - that's a new invasion into her life, she's really abandoned in so many ways and then this spark, this magic moment when she meets Rachel. And that was the last factor. We knew we needed a strong relationship at the core of this game, and with Chloe and Rachel, who she describes as her angel - Rachel saved her - that gave us all kinds of ideas for how this story could develop. In the first game, you heard a lot about Rachel without ever meeting her, so it's interesting to kind of go back and actually spend some time with that character. She's sort of like a mythical character, right? Everybody had some kind of encounter with her, and everybody loved her - so you hear a lot about her, but you also know pretty quickly she's got a lot of secrets as well. She's an intriguing and maybe flawed character also, so that made her super rich for us to explore. "We really focused on a story we could tell about Chloe and Rachel at the beginning of their relationship"
Did the fan reaction to Chloe help when you were deciding 'where do we go next'? That was obviously a big factor. We knew there were a lot of fans out there that liked her. There's an interesting minority of people who were always sort of irritated by Chloe, and one of the things we've tried to do is to help you understand her even better than in the first game. You understand her by seeing her back in this time when she's very, very vulnerable. She's kind of a character with armor around her in the first game, and so we wanted to show her at her most vulnerable and help you understand how that character came to be. You knew the end point you had to get her to - did that change the process of writing and developing the character? We very intentionally went three years back, because it's a lot of space, and we're not trying to tell a story that ends at the beginning of the first season. We wanted to give ourselves room to tell a new story that people don't really know the ending to. I think there's something especially tragic about getting to know these characters when we know - eventually, somewhere down the line - where they're going to end up. But we really focused on a story we could tell about Chloe and Rachel at the beginning of their relationship. We're going to show how Rachel's presence really pulls Chloe out of her own kind of imprisonment and abandonment and grief. And how Rachel, this perfect girl, is going to have her world collapse around her, and Chloe's going to provide the strength for her to get through that as well. That seemed like a really interesting story to us. Was it challenging to be a new developer taking on the series and the story? That was a lot of pressure, and we totally understand why we think a lot of fans were a little bit anxious about a studio other than Dontnod making another Life is Strange. So we knew we had a lot to live up to - but it was such a wonderful opportunity, and we love the original game as much as the players. I think we strived every day, to live up to the standards of the original game, and to remain as true as we can to the story and to those characters. That's a lot of effort on our part, but it's a joy, because there's so much amazing stuff in that first game. Is there a secret formula to making an episodic game? One of the interesting writing challenges is how the whole three-episode story needs to have a nice arc - but you also want each episode in itself to have an interesting arc and its own themes. Something that helped us there was that we knew we were showing a transformation in the character of Chloe, so we could take each episode as a step in that transformation. Her first meeting of Rachel and what's that like, that first spark of that relationship - and then later episodes, we're going to show how her relationship with Rachel develops, and how that changes Chloe and Rachel's situation and how that's going to basically put us onto the path of the blue haired, beanie-wearing Chloe we know from the first game. Obviously we don't have time reversal in this game, but we have Chloe's 'backchat' power - how did you decide on that as a mechanic? We wanted to find game mechanics that are particularly suited to Chloe, because I think that was - in a lot of ways - what the Rewind power was for Max. It suited her cautious approach to everything and her self-questioning, to be able to rewind and try something again, so that really fit Max and the themes of that game. So for us, we said 'Ok, how does the player 'perform' Chloe?' And the way Chloe talks, and her wit and her sort of barbed tongue, were the things that felt really core to Chloe, so we looked for a way to express that and show that in gameplay. Were there any other ideas you guys were kicking around that didn't quite make the cut? We've done a few other things that we felt were characteristic of Chloe. For instance, our graffiti mechanic is kind of the replacement for the photographs that were the collectibles in the first game. Chloe feels like she's going to be less likely to be passive or leave no trace in the world when she does something, so she makes her mark. If you come back later, you're going to see it's still there. Chloe leaves a trail wherever she goes. 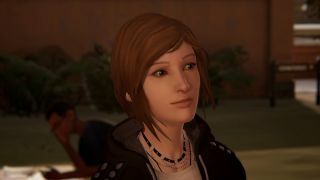 "Our youngest writer was a teenager not so long ago"
One of the things Life is Strange was praised for in the first game was the portrayal of LGBTQ characters. How do you make sure you're doing the right things in that area? It's absolutely challenging - it's a thing we took really, really seriously. I'm speaking I think for Zak [Garriss] and his writing team - they have a real culture of dialogue as a team and reviewing each other's work and thinking very carefully about it, and they get a lot of perspectives on everything they've written. Then they ask the game directors and leads on the teams to really contribute to and think about where the story's going. We all care so much about the story, and being really honest and realistic in the portrayal of some tricky issues. We try as hard as we can. We're lucky our writing team was just where all that starts in the script - we've got folks from the age of 35 to 20. Our youngest writer was a teenager not so long ago. I think we approach it in a way with a lot of perspectives. And that's really the best thing you can do, I think, to make sure you get that stuff right.